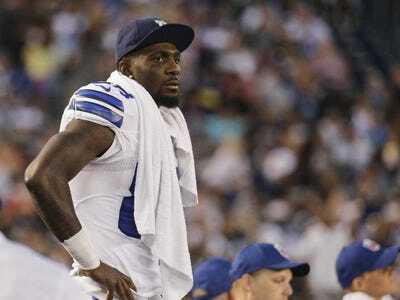 Jae C. Hong/APDez Bryant wants to be one of the top three highest-paid receivers. Dez Bryant will become a free agent at the end of the season if he and the Dallas Cowboys can’t agree on a contract extension. Bryant is at the end of his rookie contract, making $US3.14 million this season, and looking for a deal that would make him one of the three-highest paid wide receivers in the league, according to an ESPN report. Four receivers — Detroit’s Calvin Johnson, Arizona’s Larry Fitzgerald, the Jets’ Percy Harvin and Miami’s Mike Wallace — have contracts with average annual values of $US12 million or more. Six receivers — Johnson, Fitzgerald, Wallace, Tampa Bay’s Vincent Jackson, Houston’s Andre Johnson and Kansas City’s Dwayne Bowe — have at least $US20 million guaranteed in their contracts, all of which are significantly shorter than 10 years. While Bryant says it’s not about the money, it clearly is. A few weeks ago Bryant joined Jay-Z’s Roc Nation Sports, much to the displeasure of Jerry Jones. Bryant apparently wanted to change agents over the summer after he and the Cowboys couldn’t reach a deal, but Jones convinced him not to. Jones is reportedly reluctant to do a deal with Jay-Z’s agency. Jones said he wants to make Bryant a Cowboy for life, and is proud “like a daddy” at Bryant’s development on and off the field in recent years. Jones, to his credit, has been willing to spend money to help the Cowboys, but the looming extension for DeMarco Murray may factor in to how much the Cowboys are willing to spend on Bryant. Both sides have said they believe it will work out over time, but Bryant’s ominous “don’t test my loyalty” will weigh heavily the longer the two sides can’t come to an agreement.